Christopher Richard, Curator of Aquatic Biology at Oakland Museum, gave us a great talk on April 21st on the mystery of Laguna Dolores. 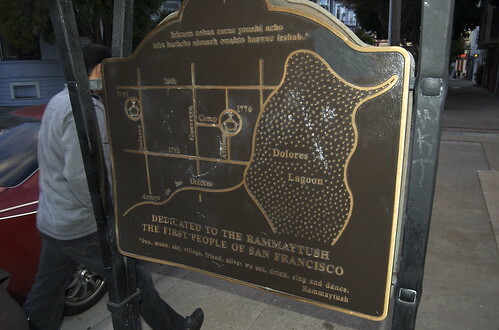 Round about 1912 a map was published showing a lake next to the Mission Dolores. A version of this map was eventually enshrined in a monument on Albion near 16th street in the Mission. The author writing about this “now vanished” lake cited a historian who cited a historian who cited… well no one. But it has become a popular part of the myth of our city’s founding. An additional shine of luster as it were to our collective romanticism about our city before it was urbanized. A lake in the Mission! But evidence — lots of evidence — shows that there never was a lake. Maps from the earliest days — in all their distorted glory (I can’t imagine being able to make a decent map as they did back then) — to the most recent pre-urbanized maps pretty much show the same thing in the area of the Mission: a tidal inlet coming in and curving south. Drawings of the area show a similar picture – one that did not include a lake. Richards walked us through map after map, and only a small sampling of the total volume he looked through. What was there was certainly wet. There were also two creeks, a 14th street creek originating from a spring near Duboce Park, and a (perhaps) more seasonal creek on 18th. The 14th street creek was gradually diverted for irrigation and eventually paved over, though it still runs under the Armory and shows itself in particularly heavy rain. The spring is gone, as it was the result of water flowing through sand dunes now long covered over. The 18th street creek went into a stand of willows which was for a time a popular place for outings. That stand connected into a body of water, not a lake, but a tidal inlet (depicted on the 1911 map as well). A drawing from the 1800s shows a creek like body of water, a bridge crossing where 16th is now, and the Mission in the distance. But no lake. To understand where the idea of the lake came from, Christopher Richard went back to the source documents and maps, pouring over hundreds of them to get a sense of what happened. The Spanish it turned out oriented themselves to water features more than say mountains and hills and consequently had a richer language for water features. Nor were the text necessarily meant to be exacting descriptions of the surroundings. Subsequent translators weren’t careful to tease out the meanings, and perhaps the historians the map maker cited were confused by all this. Father Palou did camp by a lake when he first came to San Francisco. It just wasn’t the Laguna Dolores, it was the tidal inlet. The term “springfed lake” which the 1911 map used for the mission lake, was the exact same term Captain Anza used to describe a different lake – Washerwomans Lagoon (located in the area where the Marina is now — this lake is now vanished). And to top it off the shape on the lake on the 1911 map is suspiciously similar to the shape of Washerwoman’s cove on other maps. Look for Christopher Richards work at the Oakland Museum of California. Christopher Richard, Curator of Aquatic Biology at Oakland Museum, reexamines the “now vanished” lake at the heart of the founding myth of SF.